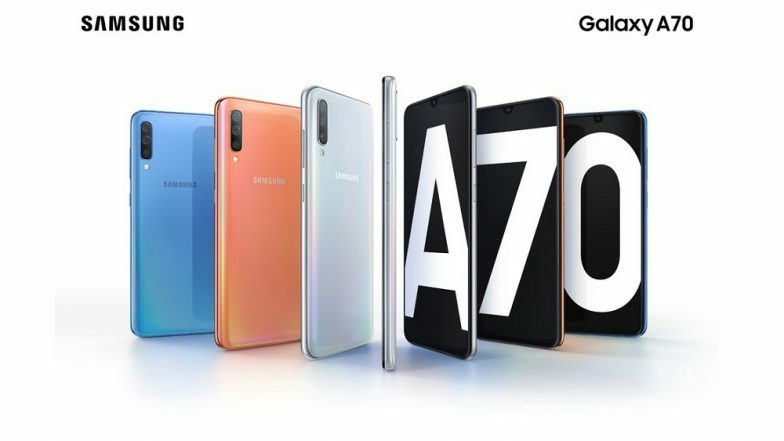 New Delhi, March 26: Samsung Electronics on Tuesday announced the launch of Galaxy A70 in its popular Galaxy A range next month. Featuring a 6.7-inch Infinity-U display along with the biggest screen in the Galaxy A portfolio to date, Galaxy A70 provides a more immersive edge-to-edge experience, the company said in a statement. The device will be unveiled on April 10. Samsung Galaxy S10 5G Smartphone To Be Launched on April 5 in South Korea. "Today's consumers are using their phones in a more visually active and authentic way - sharing their experiences and staying connected longer. "To meet the needs of this emerging generation, we created the new Galaxy A70 - designed for the way people are connecting now," said D.J. Koh, President and CEO of IT & Mobile Communications Division at Samsung Electronics. Galaxy A70 has a triple camera system with a 32MP super high-resolution front and rear lens. The device comes with 4,500mAh battery and super-charging technology. Paired with Samsung Pass, people can sign into websites and apps by using biometric authentication as an easier and more secure way of logging-in.